The founding team at TransitScreen is excited to announce that we have reached our fundraising goal and raised $600k from multiple investors with decades of experience and wisdom in the real estate, finance and transportation sectors. TransitScreen is a transportation software and digital signage company and a pioneer in providing real-time transit information displays. 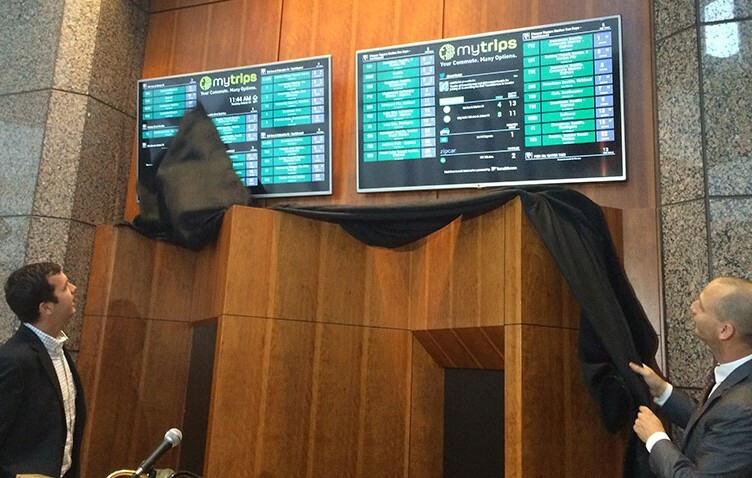 The TransitScreen service is a live, real-time display of all transportation options at a specific location (including subway, bus, train, bikeshare, carshare, and on-demand ridesharing). “This funding announcement validates the two years our team has spent building and growing the TransitScreen brand. We were already expanding rapidly, and we now have the financial capability to reach new markets and to enable more commuters, visitors, residents and employees to make better informed transportation decisions,” said TransitScreen CEO Matt Caywood. This investment will be beneficial in helping TransitScreen expand our sales efforts to more regions in North America. It will also enable TransitScreen to expand its technical team, adding a lead developer to help advance and expand our product line, and front end developers to maintain our design leadership. TransitScreen’s service currently supports 22 North American cities and over 50 transportation agencies and commercial partners. This funding will enable us to serve those 22 cities better to make transportation information more accessible, viewable and engaging to their residents and explore international opportunities.